One early August afternoon, we set out on a little boat to harvest some pacific oysters. Oysters shucked fresh from the water right there on the boat are something else. We came back with a generous haul. From planting to the plate, what is the life span of a pacific oyster? The life span of our pacific oysters range from 15 months to 2 years depending on their size. Pacific oysters are considered to be a very fast growing oyster compared to the other species we grow, the Sydney Rock oysters which take nearly 3.5 years to reach the market. 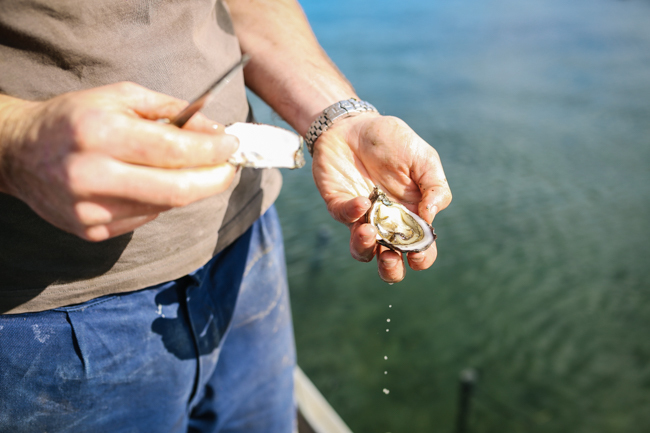 We receive our pacific oyster spat (babies) from a hatchery in Tasmania at 2.5mm in length and our first sale grade oyster is about 70mm in size (known as a “bistro” oysters). Our largest oysters grow right up to 180mm (known as “Grande” oysters). Every 3 months or so of their life the oysters are thinned out as they grow. This makes sure that they have plenty of space to continue growing and access to plenty of food. Where do pacific oysters like to grow and when are they in season? The Pacific oysters like to grow in estuaries where there is a mixing of both fresh and salt water. This mixing produces the plankton and the algae that they like to eat as filter feeders. Within the estuary itself, they tend to like areas that have a good, strong tidal flow that provides some shelter from the wind. Pacifics are in their best condition from late winter all the way through to Easter. Something interesting about pacific oysters that we may be surprised to learn? The pacific oyster can live to up to 30 years of age and grow up to 40cm! Where did your interest in farming come from? I have always loved being on the water. I studied marine biology at Wollongong University and then worked in fisheries as a researcher for a few years. During that period I was lucky to meet some people who were entering into the oyster industry, and saw an opportunity to be involved with an industry that is really improving. Things snowballed quickly from there and before I knew it, my wife Deborah and I were looking at a farm that had recently gone on the market. As a farmer, what are your thoughts on better understanding the process and origins of our food? As a relatively new farmer of only a couple of years, I have come to really appreciate the work and passion that goes into producing our food. There is definitely a disconnect in thinking between the way a lot of our food is consumed and the process it takes to get to the table. One of the reasons I was attracted to oyster farming was that it is a very environmentally aware industry. As end users of the water way, a clean pollution- free estuary is what our livelihoods depend on. So being able to educate consumers to bridge that gap between what we are eating, where it comes from and some of the processes and environmental systems involved is very important. 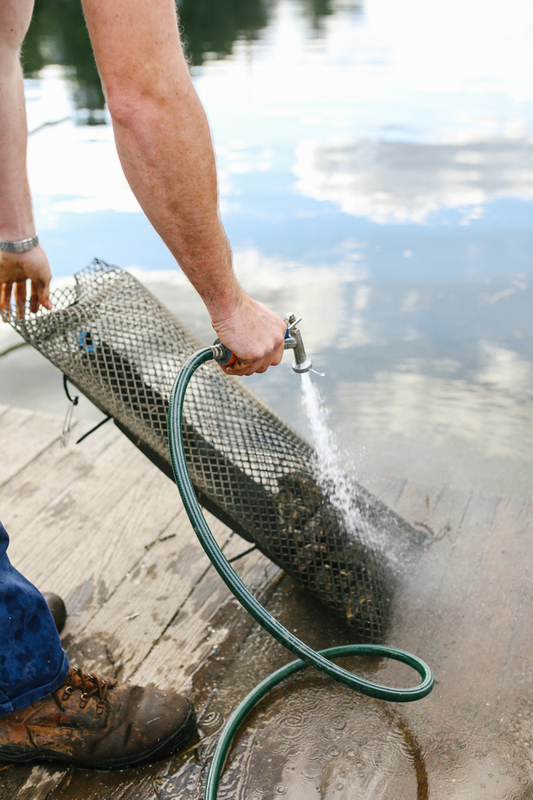 What is the best part about being an oyster farmer? Being on the river when the weather is nice and sun is out, there is no better office. The farming life also allows for greater flexibility for family time or other activities than a traditional nine to five job. As I’m sure is the case for a lot of other farmers - the weather and being outdoors would have to be both the best and worst parts of the job. A cold and rainy winter’s morning with a howling westerly wind, driving around in the oyster punt looking for your oyster bags that have been swept away in a flood is not the most enjoyable day out on the water! Your favourite way to eat oysters? My favourite way to eat oysters is to have them raw on the half shell with a drop of lemon – ideally sitting on our wharf on a Friday afternoon with a beer and a few mates. Deborah and Grant Clark own and run Clark Oysters on the Shoalhaven River in Greenwell Point, NSW. They grow and sell both Sydney Rock and Pacific Oysters. Clark Oysters were very kind in donating their oysters for the Lean and Meadow Sunday Oyster Roast (more coming soon!). They were delicious. You can find Deb and Grant at the Kiama Farmers Market every Wednesday afternoon.